, when the descendants of Elystan Glodrydd organised a historic gathering to commemorate the 1000th anniversary of the supposed year of his death in battle, along with an armorial banner of the his father Elystan’s arms. and they are recorded in his 1781 ‘A Tour In Wales’ by Thomas Pennant. 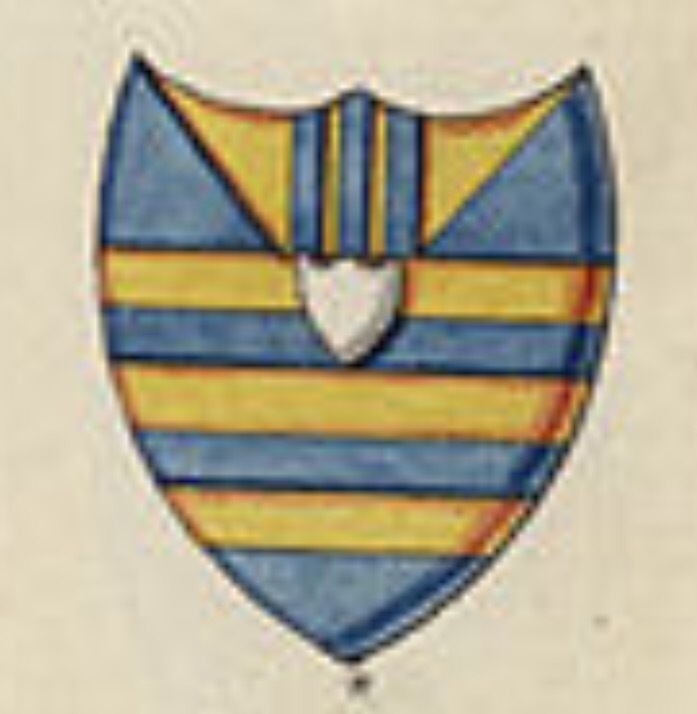 Has no Armorial bearings, but the following are quoted in Burke’s ‘General Armory’ – “Barry of six or and az on a chief of the last two palets betw as many gyrons of the first” This Coat is probably taken from that of Mortimer, which as blazoned in Woodward and Burnetts ‘Treasure on Heraldry,’ is as follows- “Parry of six or and azure on a chief of the first two pallets between two gyrons of the second, over all au inescutcheon argent”. Upon the seal of the County Council appears a shield: Barry of six pieces of gold and blue on a blue chief two gold pallets between two gold gyrons. 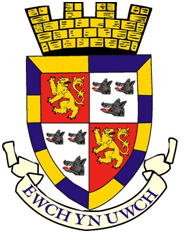 This is clearly based on the arms of the Mortimers, Earls of March (the Welsh march), who bore these arms with the addition of a silver escutcheon in the middle of the shield. The Mortimers possibly devised their arms as an heraldic representation of the Dead Sea, from which the family ‘de Mortuo Mari’ were supposed to have derived their name; the silver escutcheon may be intended to stand for the waters, and the gold and blue pieces about the sands and sky. where it appears amidst a number of emblems representing the Welsh counties. 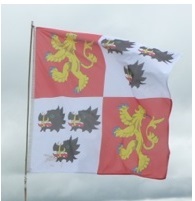 The above flag, formed from this interpretation of the original Mortimer arms without the central “inescutcheon”, which has been much used to represent the county, is evidently a legitimate proposal for registration as the county flag of Radnorshire. On this basis, seeking something that can represent a county which is unique or rare, such as the “pallets and gyrons” (bars and triangles) of the Mortimers might be a preferable course. 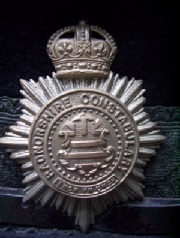 However, in the modern era the Mortimer family has come to be seen by some local people as representative of an occupying foreign force on account of the family’s origin as a Norman dynasty, which arrived in Wales in the centuries following the Battle of Hastings, notwithstanding the fact that the family ultimately intermarried with native born nobility and after several hundred years had become Welsh itself by any reasonable definition. Given the established association between the Mortimer arms and the county and the family’s contribution to local history, would dismissal of its emblem really be fair? Ultimately though, local sentiment will prevail and such considerations as have been noted will be overridden by the community’s preference, which is evidently strongly in favour of the emblem of its celebrated forbear. Thanks to Brady Ells and Philip Beddows for their extensive research used in this account. This entry was posted in Radnorshire. Bookmark the permalink.